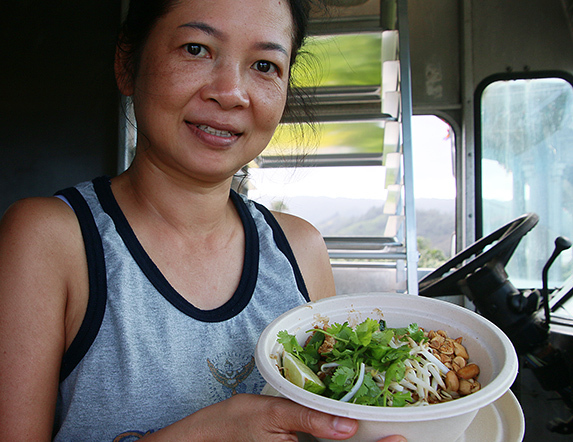 The Elephant Shack food truck, which has been a favorite on the North Shore for years, is already drawing repeat customers among Thai food fans! 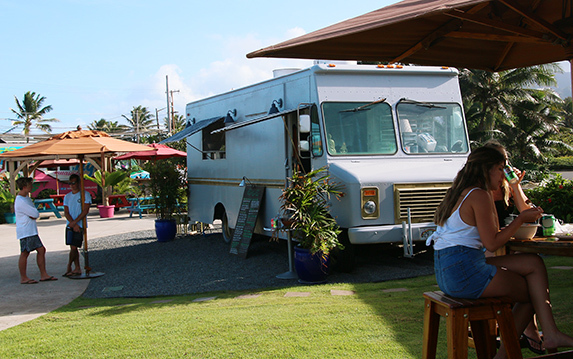 The newest addition to the Polynesian Cultural Center’s Hukilau Marketplace moved its service to La’ie October 16, 2018. Elephant Shack manager, Mem Nannaphat, serves freshly made Pad Thai. The range of Thai food is known around the world for its harmonious blend of fresh vegetables, herbs, moderate amounts of shredded or chopped meat, coconut cream sometimes, and spices with dishes ranging from pleasantly piquant to fiery. Elephant Shack manager Mem Nannaphat, who is originally from Chiang Mai in northeastern Thailand, has been cooking in Hawaii for about five years and is happy to adjust the spices however her customers want it. “We can make our dishes mild or really hot,” said Mem. In case you’re not familiar with Thai food, she explained, “We use a lot of veggies, and Thai food usually has more flavor. 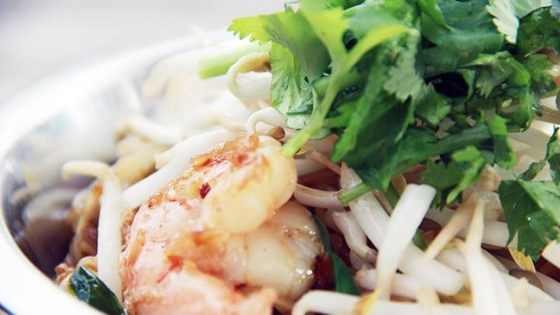 Everything’s fresh, and we don’t use MSG.” She added that Thai food is also a flavorful option for vegetarians and vegans. The Elephant Shack currently offers 11 main dishes, but first, a warning: continuing to read this article may make your mouth water in anticipation. Included on their menu is the ever-popular Pad Thai (flavorful Thai rice noodles stir-fried with your choice of meat or tofu and garnished with roasted peanuts, cilantro and bean sprouts) and Panang Curry (a coconut-cream red curry dish made without oil and flavored with ginger, your choice of meat or tofu, served over jasmine rice). Among other popular dishes are Larb Gai (minced chicken wok-fried with northern Thailand citrus sauce, cilantro, lemon grass, mint, red onion and kao kua seasoning, served over jasmine rice) and Goong nam prik pao (shrimp cooked in house sauce with Thai basil and red onion over jasmine rice). Several dishes are also vegan and vegetarian friendly! 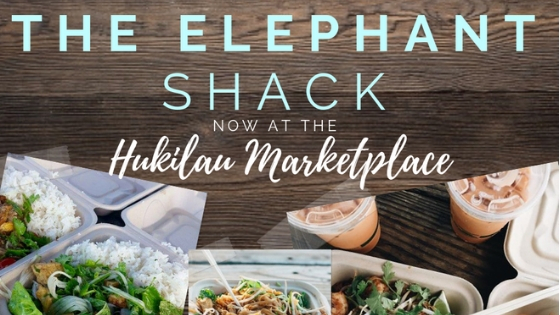 The Elephant Shack Thai food truck at the Polynesian Cultural Center’s Hukilau Marketplace. Check out reviews on Yelp! And Trip Advisor. Story and photos by Mike Foley, who has been a full-time freelance writer and digital media specialist since 2002. Prior to then, he had a long career in marketing communications, PR, journalism and university education. The Polynesian Cultural Center has used his photos for promotional purposes since the early 1970s. Foley learned to speak fluent Samoan as a Latter-day Saint missionary before moving to Laie in 1967, and he still does. He has traveled extensively over the years throughout Polynesia, other Pacific islands, and Asia. Though nearly retired now, Foley continues to contribute to PCC and other media. BTW, Foley loves Thai food.